Two nightclubs, a Land Rover, a motorbike and a penthouse towering 15 metres above the sea: an impressive tally for the former Indesit chairman’s new Floating Life and Studio Sculli-designed, Cantiere delle Marche-built yacht. 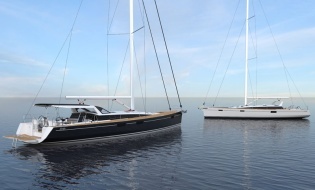 The new Nautor's Swan 65 was designed by Germán Frers and follows the latest design trends of modern ocean racers. Alexander 90R is the first model of the new Revolution Series and Evan K Marshall has teamed up with Ocean Alexander once again for this project. The first superyacht in the Alloy 43 meter series has been successfully launched in Ancona-Italy as announced by ISA Yachts. Düsseldorf will host Ferretti Group with a fleet of 7 models at the first important event of the winter nautical season and meanwhile everything is prepared for the world launch of a new amazing model of sporty and streamlined superyacht signed by Pershing, which will be unveiled right in Düsseldorf. Benetti has heralded in the new year by launching a small but spirited 29m, part of the Delfino 95’ series. Eurus is a displacement yacht with a sleek exterior and refined interiors. CRN announced the delivery of the stunning new 50m superyacht Latona.